Older, Smaller, Better: Measuring How the Character of Buildings and Blocks Influences Urban Vitality, a new report from Preservation Green Lab, validates Jacobs' long-respected, but largely untested hypothesis -- that neighborhoods containing a mix of older, smaller buildings of different ages support greater levels of positive economic and social activity than areas dominated by newer, larger buildings. 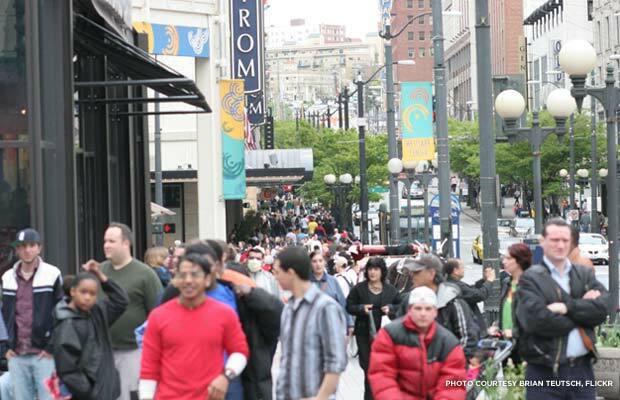 Older, mixed-use neighborhoods are more walkable. Young people love old buildings. In all three study cities, the median age of residents in areas with a mix of small, old, and new buildings is lower than in areas with larger, predominantly new buildings. These areas are also home to a significantly more diverse mix of residents from different age groups. Nightlife is most alive on streets with a diverse range of building ages. In San Francisco and Washington, D.C., city blocks composed of mixed-vintage buildings host greater cell phone activity on Friday nights. In Seattle, areas with older, smaller buildings see greater cell phone use and also have more businesses open at 10:00 p.m. on Friday. Older business districts provide affordable, flexible space for entrepreneurs from all backgrounds. In Seattle and Washington, D.C., neighborhoods with a smaller-scaled mix of old and new buildings host a significantly higher proportion of new businesses, as well as more women and minority-owned businesses, than areas with predominantly larger, newer buildings. 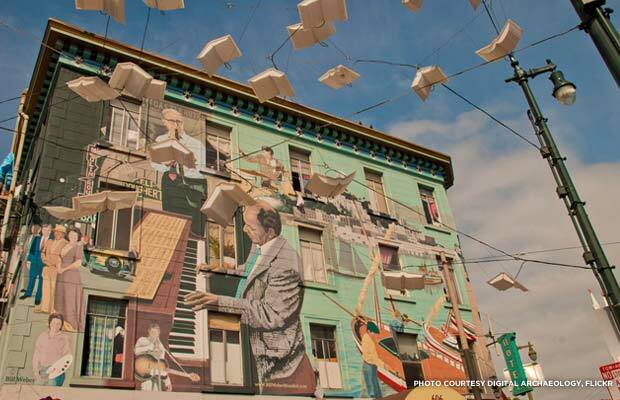 The creative economy thrives in older, mixed-use neighborhoods. In Seattle and Washington, D.C., older, smaller buildings house significantly greater concentrations of creative jobs per square foot of commercial space. Media production businesses, software publishers, and performing arts companies can be found in areas that have smaller-scaled historic fabric. Older, smaller buildings provide space for a strong local economy. In Seattle and Washington, D.C., streets with a combination of small, old, and new buildings have a significantly higher proportion of non-chain restaurants and retailers than areas with new, bigger buildings. And in all three study cities, areas with older, smaller buildings host a significantly higher proportion of jobs in small businesses. Older commercial and mixed-use districts contain hidden density. Across the three cities, streets with a mix of old and new buildings have greater population density and more businesses per commercial square foot than streets with large, new buildings. In Seattle and Washington, D.C., these areas also have significantly more jobs per commercial square foot. Realize the efficiencies of older buildings and blocks. This research shows that older, smaller buildings and city blocks “punch above their weight class” on a per-square-foot basis. Their efficiencies include mixed daytime and nighttime uses; common entrances and shared services; creative use of small spaces and storage areas; and very little space dedicated for cars. Codes and regulations may need revision to encourage these efficiencies (for example, dropping parking requirements). Fit new and old together at a human scale. Findings from the three studies show that mixing buildings from different vintages -- including modern buildings -- supports social and cultural activity in commercial and mixed-use zones. In the report, scale also played an important role: Areas with smaller lots and more human-scaled buildings generally scored higher on the performance measures than squares characterized by larger lots and structures. Support neighborhood evolution, not revolution. The higher performance of areas containing small-scale buildings of mixed vintage suggests that successful districts evolve over time, adding and subtracting buildings incrementally, rather than comprehensively and all at once. Many of the highest performing areas in the study cities were commercial districts with buildings that date to the streetcar era. Nearly every American city (and plenty of small towns) once boasted a network of streetcar lines. As cities seek to re-establish transit corridors and foster mixed-use development, the existing streetcar infrastructure provides a head start. Make room for the new and local economy. The Older, Smaller, Better research confirms a correlation between a higher concentration of creative jobs and older, smaller-scaled buildings and blocks. These areas also support higher levels of small and non-chain business, helping to keep dollars in the local economy and providing more resilience against future economic storms. Make it easier to reuse small buildings. Vacant and underused buildings are an untapped reservoir of existing density. Cities can help unlock the potential of these spaces by removing development barriers, such as outdated zoning codes and parking requirements, and streamlining permitting and approval processes. Targeted incentives and financing programs are also needed to assist small-scale projects. The Preservation Green Lab’s goals are to identify opportunities and to share solutions that benefit residents, property owners, investors, and community leaders alike. Read the complete Older, Smaller, Better report for more detailed results and recommendations, including the research methodology and community case studies. For additional information, check out the Preservation Leadership Forum series on the report that includes more details about its source material, shows how big data can be used for historic preservation, and gives a refresher on Jane Jacobs' philosophy.